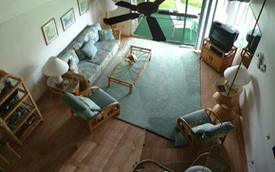 Owner Rental just steps from Kam III beach. 2737 S. Kihei Road, Kihei, Maui, Hawaii. Whether you're looking for the perfect spot for beach front activities or for simply enjoying the ocean view,Hale Kamaole #270 is hard to beat. Our Maui rental has been in the family for over 20 years. It can handle groups of up to 6. Check our RATES, there isn't a better value on island. We are located on the "sunny-side" of Maui, adjacent to Wailea, and just 30 minutes from Kahului Airport or 40 minutes from Lahaina and Kaanapali. 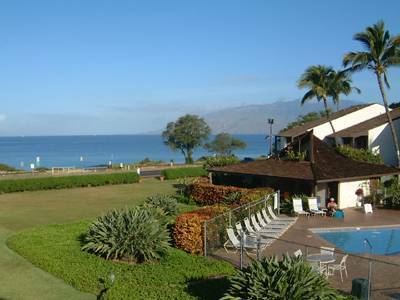 #270 overlooks Hale Kamaole's lower pool and is just a few steps from the beautiful white sands of Kamaole III beach (considered one of the finest on the island of Maui) at the quiet, southern end of Kihei. 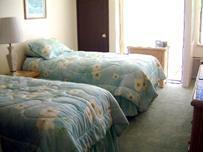 Our 2 BR/ 2 Bath condominium (with sleeping loft) has been recently updated. Among other changes (tile, new furniture, carpet, etc) the condo now has a new kitchen and hardwood floors to go with its spectacular ocean view. The newly renovated kitchen is bright and cheerful, has expanded storage and includes a dishwasher, disposal, microwave and an assortment of small electric appliances found in most homes. Plates, place mats, pots and pans... it is completely outfitted. Also available for your use: an answering machine, computer compatible phones, cable TV/ VCR, air-conditioning, ceiling fans, washer/dryer. The living room has a high lofted ceiling. Stairs lead to the sleeping loft (over the kitchen) where this photo was taken from, and master suite. The master bedroom suite is located on the second floor of the two story condo. It has a private bath and dressing area, a king size bed, lots of closet space, air conditioning and a ceiling fan. The master bedroom has A/C and it's own dressing area with bath. Nice views and privacy! The loft, also upstairs, has a queen sofa sleeper and is ideal for children. The LANAI or balcony is great for watching whales - or anything else happening on the water. We love having morning coffee here and watching the sun move across the west Maui mountains. The second bedroom is on the main floor and has two twin beds, plenty of closet space, a ceiling fan and A/C. The twin bedroom is on the first floor just a few steps from a full bath, washer/dryer and our new kitchen. This two tier design condominium development is beautifully landscaped with island foliage and flowers. Wait til you hear the conch band - begun by our patriarch, our own "big kahuna". We all love walking the beach and can often be found taking a quick snorkel across the street, doing a little boogie boarding, building a sand castle or quietly reading a book. You can spend long relaxing days on the sunny white beaches or play a round of golf on one of the 6 courses within 5 minutes of our condo.  14.417% State of Hawaii Hotel and General Excise Taxes will be added to the bill.  Rates quoted are for up to 4 adults. 14 nights during holiday season. 7 nights at other times unless last minute rental or filling a hole. * Cleaning fee charged for stays less than 7 nights. If you don't see the dates you need here, contact us anyway. For Concierge and Real Estate services, links to golf on Maui and more..
our entry is near rocks at top. BBQs at Hale Kamaole are a great place to meet other folks. It's pretty much a "guy thing" when it comes to the grilling, which suits Debi just fine. Grilling is often our dinner of choice both because of the variety and quality of fish, chicken and steaks on Maui and because our kids are exhausted by the end of the dayl. We do manage to take advantage of the many nearby restaurants from time to time and will happily share our favorites with you. Lots more to do on Maui - Every season is similar - Everyone hates to leave. Come join us for your time in PARADISE. Hale Kamaole across from the sandy bottom, well protected Kam III beach. We have a packet with directions, maps, things to do, contact numbers for golf and tennis, etc that we mail after full payment is received. We can send info on reduced rate car rentals upon request. If our Hale Kamaole unit isnt available, we can often recommend others, including our Maui Kamaole H209 property next door. For those of you who have stayed in unit 270 previously, you may be wondering what happened to Steve and Kay... Well, Steve & Kay are Debi's parents and recently decided the time was ripe to sell. Eric and Debi are thrilled to take over the place. We've been visiting #270 ever since Mom and Dad bought it - why not when you can mooch off your parents? Steve & Kay are still wintering on Maui and then return to Tennessee for the remainder of the year. The place still boasts all the wonderful amenities and of course the view is still spectacular. We will undoubtedly add our own touches, but Mom and Dad's mark is forever part of Hale Kamaole #270. Drop them a line if you'd like, Their contact information remains the same. Copyright © 2002-2015 sjPat.com - The Patterson-Sorensen's Place. All rights reserved.